April 6, 2017 (Waregem, Belgium). 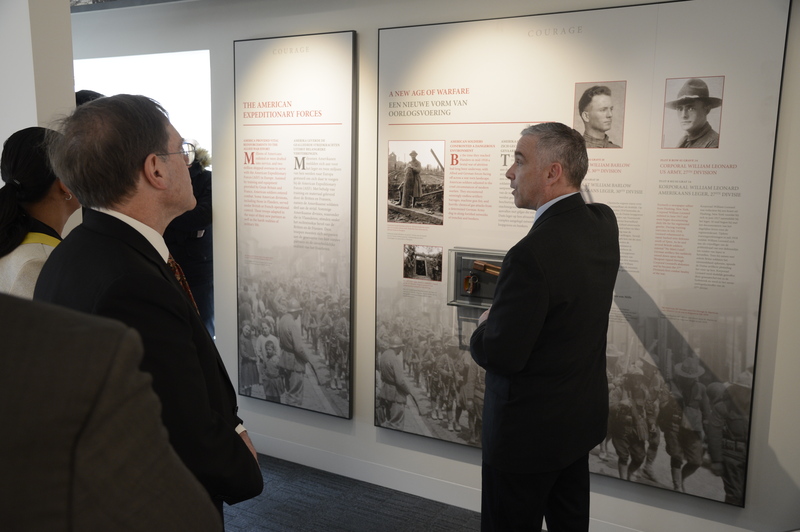 After years of planning and construction, a brand new Visitors Center at the Flanders Field American Cemetery has officially opened its doors to the public. 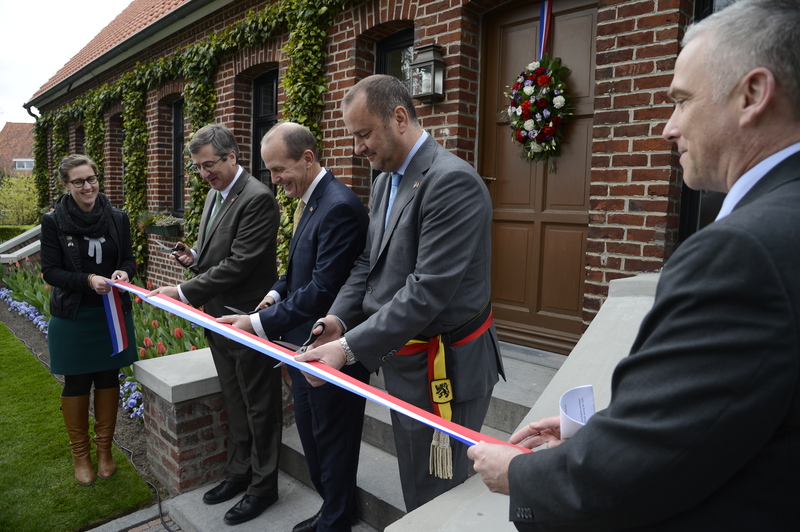 On a sunny April afternoon, invited guests representing the United States, Belgium, Australia, Canada, France, Germany and the United Kingdom gathered together to dedicate the center with a ribbon-cutting ceremony, guided tour and reception. 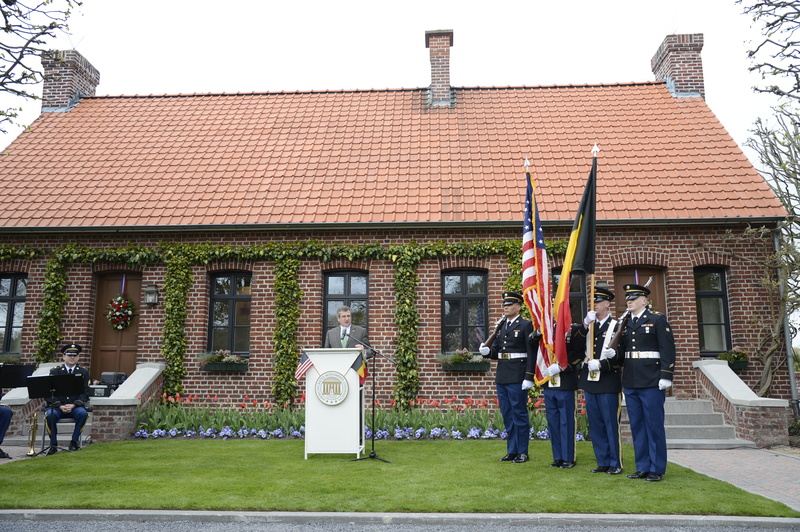 The date of the event was chosen to coincide with the one-hundredth anniversary of the United States’ entry into World War I, when young men came to Belgium to defeat tyranny and safeguard democracy. 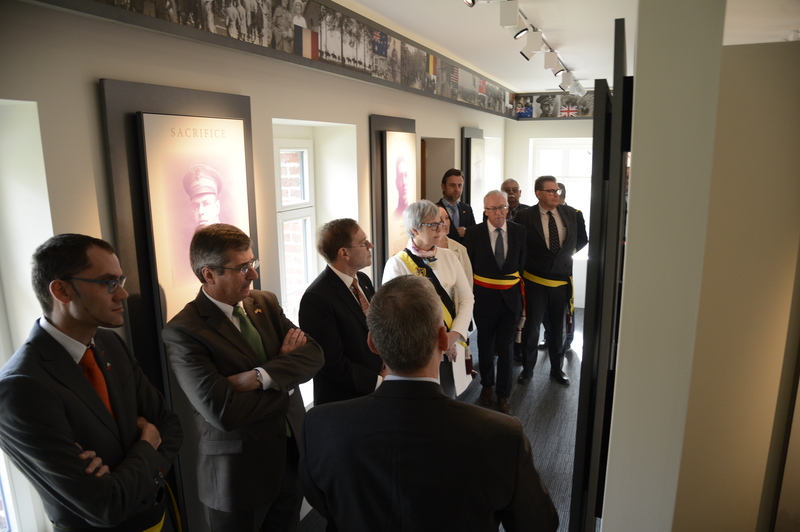 The Visitors Center was constructed by the American Battle Monuments Commission and explains America's role in the liberation of Belgium during the First World War, and the battles in which the four American Divisions that served in this Belgium were engaged. In English and in Dutch, it demonstrates how the United States Army drew from all walks of life: including recent immigrants, different ethnic groups, various geographic regions of the United States, and military and non-military professions alike. It also underscores the special American-Belgian bond that has developed over this past century through the shared experience of the war. Among the Center's features is the Gold Star Mother's Room, restored to its original appearance. In this room, in the years following the Great War, the cemetery superintendent would welcome those mothers whose sons are buried in the cemetery to express and share their grief together. In this way, the Center seeks to preserve the original 1920’s design. The exhibit includes several changeable panels that tell the stories of several soldiers buried at the cemetery, including those of 1st Lt. Albert Closterman, Pvt. George Ashe, Sgt. Paul Kicka, Pvt. Stanislaw Labno, Pvt. Anthony Durand and Pfc. Michele Chimienti. During the opening ceremony, United States Chargé d’Affaires a.i. Matthew Lussenhop thanked those who gathered to honor those who fought and died, remarking: “Whoever you are, wherever you are, you are living in a world that has been shaped and defined by the First World War.” He also thanked the American Battle Monuments Commission for keeping the memorial and cemetery in pristine condition day in day out, rain or shine, and ensuring that the sacrifice of our soldiers buried here will not be forgotten. Mr. Lussenhop offered thanks to Waregem Mayor Kurt Vanryckeghem and other local residents for their steadfast friendship and support. The Mayor in turn announced the imminent opening of the adjacent local “Hippowar” Visitors Center that will be accessible from the Flanders Field Visitors Center via a path made of 411 tiles, each representing one of the 368 servicemen buried at the cemetery and the 43 soldier’s whose names appear on the Wall of the Missing. The Flanders Field American Cemetery Visitors Center is open daily from 9 am to 5 pm. Admission is free-of-charge and no reservations are required.